A.I. 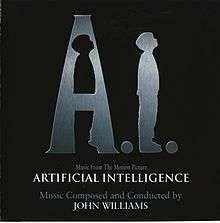 Artificial Intelligence - Music from the Motion Picture is the film score of the 2001 film of the same name, composed and conducted by John Williams. The original score was composed by Williams and featured singers Lara Fabian on two songs and Josh Groban on one. The 2001 official soundtrack album did not include all of the music from the film, and several cues were conspicuously absent. A promotion-only release of the complete soundtrack was created for members of the Academy of Motion Picture Arts and Sciences that were responsible for voting for the award for Best Original Score. This version of the soundtrack later leaked to the public, and has been issued in several bootleg editions by various record labels. Then, in 2015, the complete score was officially issued for the first time in a 3-CD set by La-La Land Records. The cues presented on the initial commercial release do not follow the order they are heard in the film. The album cues can be heard in the following order: 6, 4, 2, 7, 10, 1, 3, 11, 8, 12, 9.